It is open! On the 17th of February, Dentsply Sirona’s new world-class manufacturing site for production of Atlantis and Simplant solutions in Tokyo officially opened. The new facility is the first to cover production for Dentsply Sirona’s whole digital implant solutions portfolio and is an important brick in the effort to provide faster dental care for and superior customer care in selected markets in Asia. 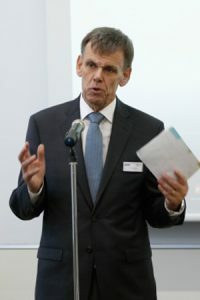 The inauguration ceremony, which took place in conjunction with the opening of World Summit Tour in Tokyo, characterized another significant milestone for Dentsply Sirona’s digital implant solutions. Last year marked the 20th anniversary for Atlantis, and at the same time, the sales for the brand passed 2 million abutments sold worldwide. Now the success story for Dentsply Sirona’s offering within digital implant solutions continues. The opening of this world-class manufacturing facility really emphasized Atlantis’ and Simplant’s presence – and grand ambitions – in the Asian market in general and the Japanese market in particular. Both Atlantis and Simplant brands have been established on the Japanese market for quite some time. Simplant Surgical Guide was commercially offered in 2006. The guide was made in Belgium at that time. Atlantis suprastructures were introduced in 2012 and the Atlantis abutments product line 2015. Since the introduction, growth has been at a very fast pace and forecasts indicate continued strong progress. In order to succeed, the new production facility is an important piece of the puzzle. “We have really built this production facility for the future. We have estimated that the production capacity will need to manage a three- or four-fold increase of current sales. 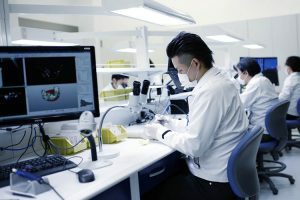 This means that initially we will probably also support other markets in Asia and the Pacific”, says Mr. Mitsutoshi Onoda, VP, Commercial Lead of Implants, Orthodontics and Prosthetic at Dentsply Sirona in Tokyo. Design and production close to the market will also shorten the lead times to customers,and thus patients, which further will strengthen the brands’ benefits and market position. From the start, the new facility will contain manufacturing equipment for Simplant surgical guides, Atlantis abutments and Atlantis suprastructures. “Today we have a turnaround time of about 7 days, including design for Atlantis abutments, production, verification and shipping, as we need to use our production facility in Sweden. Now we can offer our customers delivery within 48 hours, and with the same high quality, which of course will strengthen our offer radically,” says Mr. Onoda. The planning and construction of the new facility in Tokyo has been at an intense and fast-moving pace. Group management decided on a new plant in 2015, then the work started to find a suitable location in the mega-city that met the highest standards in terms of both logistics and growth opportunities, in order to create a facility for world-class manufacturing. Besides space for design, production, quality control and verification, the new facility also contains rooms and areas for lectures, meetings and live demonstrations. The facility will be able to receive customers and authorities from the industry and showcase one of the industry’s most modern plants. The Japanese dental implant market in general had a strong growth between the years 2006-2012, which was then abruptly halted. Now, after some years of decline, the market is on a positive route. However, the future looks really bright for Dentsply Sirona’s offering within digital implant solutions, according to Mr. Onoda. “Competition in the market is tough, but we can offer solutions that are of the highest quality, which deliver true value to customers, and patients and I would say are better than our competitors. 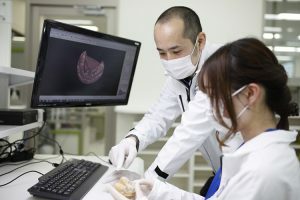 In Japan, the vast majority of the dental laboratories are small single person labs, and outsourced digital dentistry is the best and most natural solution for them. As we start manufacturing in Japan and can put the “Made in Japan”-stamp on our products and solutions, we will become even stronger”, says Mr. Onoda, who also sees an advantage in marketing their offering to the large and intriguing group of general practitioners on the Japanese market. “There are rather few specialists in the market. Instead, general practitioners here usually offer full service and takes responsibility for the entire restoration process. For this large group of customers, it is easy to explain the advantages of our digital implant solutions portfolio with Simplant and Atlantis. And thanks to this world-class manufacturing site and our clearer presence on the market, we are now even stronger and more well-equipped for the future”, concludes Mr. Mitsutoshi Onoda. Lars Henrikson, Group Vice President Dentsply Sirona Implants, at the opening. Mitsutoshi Onoda, VP, Commercial Lead of Implants, Orthodontics and Prosthetics at Dentsply Sirona, with staff at the new factory.